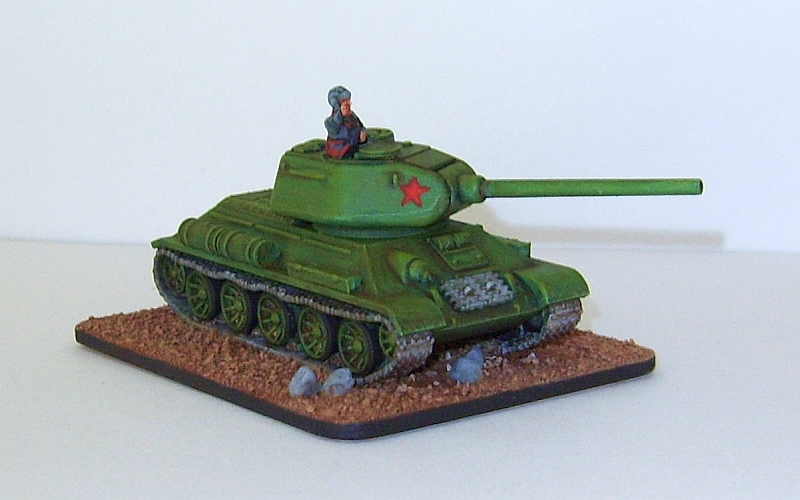 In early February I bought a box of 5 Plastic Soldier Company 15 mm T34s. They looked great and stirred memories of the Airfix kits of my youth. The plan was to use them to see if I could, and enjoyed, painted tanks. Needless to say they've sat on my shelf until this week when I decided it was time to build and paint a test kit. Here's a work in progress shot. The base isn't quite finished and I need to get some transfers for the turret but otherwise it's done. Overall I'm pleased with the end result. 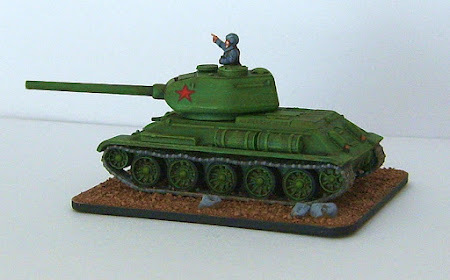 I aimed for a cartoon representation of a tank that will stand out on the table. As always the build didn't go according to plan. Sticking this together with super glue was relatively painless and the finished model seems reasonably solid and stable. I put some metal nuts inside the body of the tank to give the model some weight. I'm pleased with the colour scheme I ended up with. It's only two colours and a wash made with Burnt Sienna watercolour. It's useful that Russian tanks could be almost any colour green. The hand painted red star stands out really well and it was really easy to get the detail on the model to "pop". I also tried a new basing scheme: sand washed with Burnt Sienna watercolour and one colour dry brush. This was really quick and effective. I'll be using scheme this a lot more. The tracks! After I built the model I realised that the tracks have and inside and outside edges. Now I know what I'm looking for I'll get in right on the other four. The reserve tanks. These should have been placed a little higher up and not resting on the track guard. Not a major issue but it highlights the lack of any instructions with the kits. At least they will be a lot more secure. The command figure. This is very small for 15 mm. The detail is there it just takes a while to paint but it doesn't really fit in the left hand hatch as there's not split hatch cover in the kit. Compared to my usual medieval and renaissance subjects there's a lot of research in a basic model. The internet makes it easier but I'm concerned I'll get drawn into "rivet counting" territory. "The green was based on Vallejo Model Colour 922 (USA Uniform). This base was dry brushed with VMC 857 (Golden Olive) then washed with burnt sienna watercolour. Then a few intermediate highlights with mixes of the two greens and all final highlights with VMC 857." Hi Martin long time no comment. Lovely little tank mate. February till June is quite good in my book. I have had stuff on the shelf for 20 years! James! A long time indeed and I see you've re-activated your blog: great stuff.